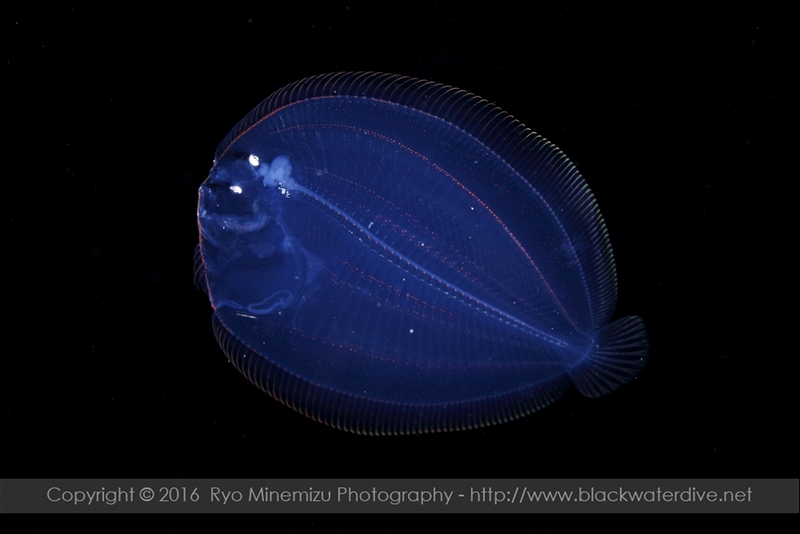 Taken at Kume-island Black Water Dive® on 29th july 2016. This larva is not few. If anything, it appears many on the surface thure the year. B. myriaster - D 85-97; A 61-73; P1 8-10(Eye side); V 37-39. Bothus mancus (Broussonet, 1782) - D 96-102; A 74-81; P1 11-13(Eye side); V 39-40. Bothus pantherinus (Rüppell, 1831) - D 88-100; A 64-72; P1 10-11(Eye side); V 37-38. Nakabo, T. (ed. ), 2013. Fishes of Japan with pictorial keys to the species, third edition. Tokai University Press, Kanagawa, Pp, 2428. (in Japanese). Okiyama M. (ed), 2014 An Atlas of Early Stage Fishes in Japan Second Edition Tokai University Press, Japan. :Pp,1912. (in Japanese).